An co-worker is having a baby in a few months and instead of the traditional baby blanket that I usually make (she already got one last baby), I decided to make a sweater and hat. If I have time I’m going to knit up some booties too. 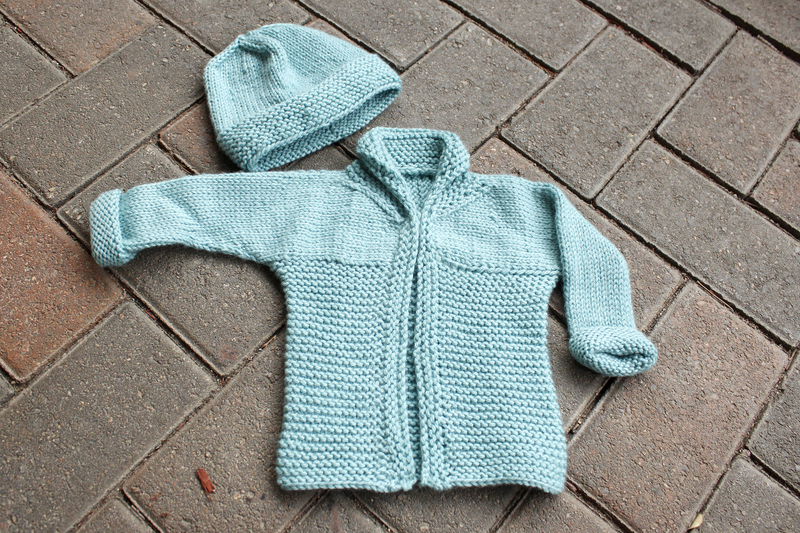 I made the sweater and hat on the fly – no pattern for either. I didn’t even count stitches in a few spots – it was really that much on the fly. I would like to write up the pattern so I’ll have to make the sweater again to be sure that I get it all right. The sleeves are two tubes with open ends for the neck area, then they were stitched together. The I picked up stitches along the bottom edge of the sleeve area to knit the bottom of the sweater. The collar was knit using short rows. I’m not completely happy with the result only because my stitching on the back is a bit off and the tension of the short rows was too loose. But a remake should be better.